The South American Terrestrial Reference System (SIRGAS) is defined according to the IERS conventions. The reference frame is realized by a set of three-dimensional geocentric coordinates of about 60 stations derived from a continental GPS campaign in 1995 (epoch 1995.4). The time evolution of station coordinates is defined by the true station motions, in a linear approximation given by the station velocities. These velocities may either be determined from continuous monitoring or from repeated GPS campaigns. The actual continuous monitoring within the IGS Regional Network for South America includes 16 stations on the continent. The linear station velocities derived from two years of observations are presented. As an example of irregular deformations, results from repeated GPS campaigns in a boundary zone along the Caribbean and South American plates are shown. Linear station velocities are estimated as well as unsteady station motions as a consequence of an earthquake. 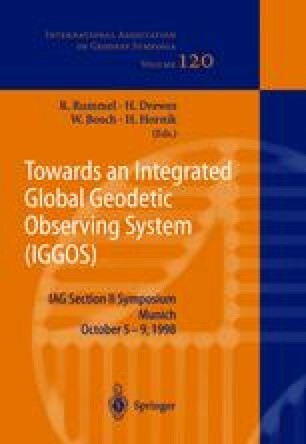 The adequate consideration of these motions in a global geodetic observing system is an important issue.